Wli Falls and Aburi Garden. The guide-book says, in reference to Wli falls that the trail leading to the lower falls is easy, with the upper being a bit more “arduous.” I wonder, desperately, how this description is adequate. I’m not moving, but I can feel myself slowly slipping down the embankment. I have a death grip on the various vines extending onto the trail. I look down as my feet slip, slowly through the mud at a 45 degree angle, towards the bottom of the hill. My skin is desperately trying to cool me through evaporation, but the humidity ensures a thin layer of moisture never leaves me, mixing with the specks of dirt and blood from tangling myself in vines moments earlier. I’m breathing, and continue, slowly on. As I near a turn, the thundering symphony of a million drops of water against rock becomes deafening, a steady, light mist comes up. Nearly two hours of muddy hand-over-hand climbing, and anchoring myself from sliding down the cliff face leads me to the falls, and every moment was worth it. Though not the largest falls I’ve ever seen, these were certainly a breath-taking sight. 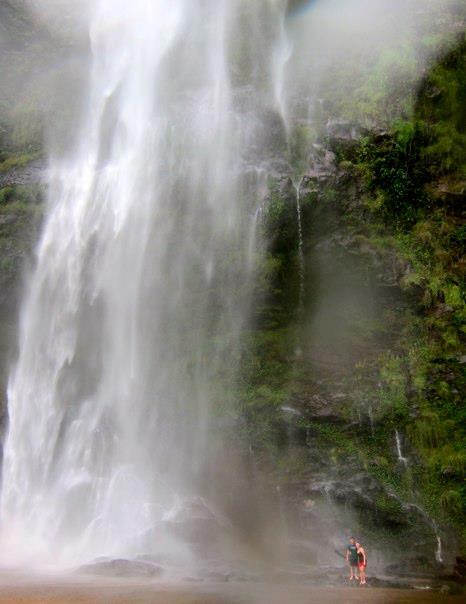 Looking up-because you cannot see the entirety of the falls in one field of vision, it bounds over the summit that divides Ghana from Togo, to fall to the still body of water beneath. The mist is so strong that even 50m away we are soaked, though it is welcome, as the mud from the hike slowly trickles its way off our legs. It would be nearly impossible to resist the temptation to run into the shallow water. After removing our shoes we ran in, the current mild at first, the wind getting stronger as we approach the rocks protruding beneath the falls. It is exhilarating. And easily, the highlight of the trip thus far. To reach the falls is a triumph, in part because the rainy season makes it significantly harder, but mostly because there is no other access. To reach them, you must make the hike. And not only that, but you must also get down-a task equally, if not of greater difficulty. After reaching the bottom, four hours after we set off we turn into a nearby restaurant, and almost as if on cue, the sky opens and begins a slow rain that eventually turns into a down-pour. We were beyond lucky, to have missed the rains by minutes. We ate lunch under an open air canopy and once the rains dissipated, returned to our hotel where hot water and AC greeted us-these are the luxuries we have come to cherish. The Wli falls, located on the border of Togo is about four hours away from Kofridua, and luckily, we made that trek-both there and back with little fanfare. To say the least, it was much more relaxing than our previous weekend venture. And perhaps, we were just unlucky, my faith in public transportation while tarnished, is beginning to return. On Friday, we took a short ride (again, without trouble) to the Aburi gardens. Not sure what to expect, we were certainly surprised. The gardens are arranged (a loose term) in a self-guided walking tour. It took a while to figure out how to navigate, upon arrival, it’s quite confusing. But it ended up being a great day trek, along with the various plants (and cocoa trees-varietal theobroma, pastry training in overdrive) there were also several bugs of interest greeting us in the middle of the pathways. Specifically, ants. Ants are everywhere here, and you have to take care to jump over the highways they create, to avoid several painful bites. There was also a crashed helicopter, maybe 40-50 years old, just abandoned in the middle of the gardens, no explanation whatsoever. This entry was tagged Aburi Gardens, Hiking, Waterfalls. Bookmark the permalink. We second the motion about your “put the reader right in the moment with you” writing!! And here’s hoping you read all further Ghanese guidebook descriptions with very skeptical eyes! Very relieved you both made it through this new adventure intact!